Turquoise is one of my all-time favourite stones. Reputed to be the healer’s stone, I find it has a lovely energy which is both calming and fosters creativity. Since it is a throat chakra stone, it will also help you with self-expression. 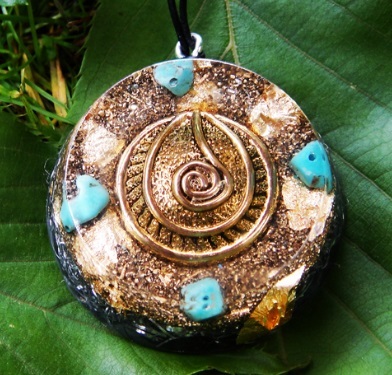 A turquoise orgonite pendant is perfect for healers, or anyone that wants help in healing physical, emotional or mental illnesses. It is known as a fantastic all-round healer stone. This is because it is associated with the thymus, which is located between the heart and the throat. The thymus produces white blood cells that improve your immune system. Thus, turquoise is a great immune system stimulator. Turquoise stimulates the throat chakra, which deals with communication, self-expression and creativity. It also fosters communication between the heart chakra and the throat chakra, and it opens up the heart chakra for giving and receiving love. It encourages clarity, as well as verbal expression and authenticity. 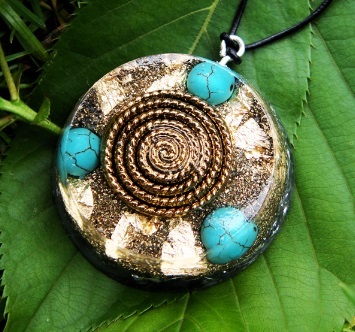 If you are a shy person, or find it difficult to express your feelings, a turquoise orgonite pendant can help you with this. 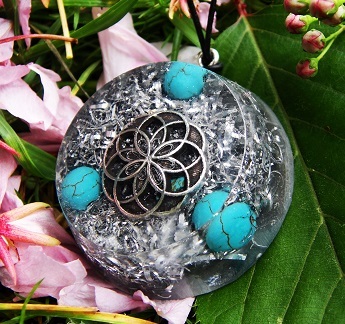 When meditating with turquoise orgonite, I find that my creativity increases, and new ideas start to flow to me. It is a stone that connects you with your higher self, and it can encourage you towards your true path in life. It also heightens sensitivity, and helps you with the flow of ideas. You seek the mental and spiritual clarity to find your path in life. If you want to buy a turquoise orgonite pendant, including the ones pictured on this page, head over to turquoise pendant section on the Orgonise Yourself Store.